Bella Thorne & Sister Dani Team Up for Horse Race in Florida! | Amanda Cerny, Bella Thorne, Dani Thorne | Just Jared Jr.
Bella Thorne & Sister Dani Team Up for Horse Race in Florida! Bella Thorne sports a see-through ensemble at the 2019 Pegasus World Cup! 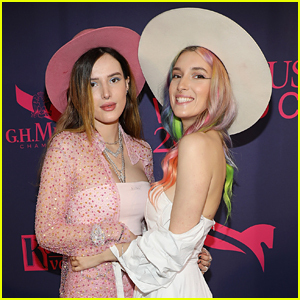 The Midnight Sun star and her sister Dani Thorne stepped out for the event held at Gulfstream Park on Saturday (January 26) in Hallandale, Fla.
Bella donned sheer pink sequin pants, a matching shirt, tube top, pink hat, blue purse, and an assortment of jewelry. She was also joined by Snoop Dogg and actress Amanda Cerny. ICYMI, hear what Bella recently had to say about her open relationship with Mod Sun and Tana Mongeau. Bella Thorne Jams Out to Sister Dani's DJ Set at Moxy Chelsea's Grand Opening! Bella Thorne & Delilah Belle Hamlin Won Fashion Week & We Have Receipts! 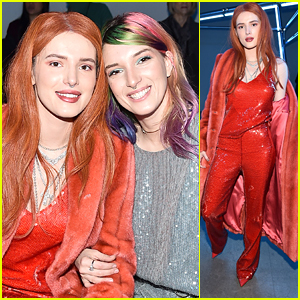 Bella Thorne & Victoria Justice Are Having Fashion Week Fun! Bella Thorne & Big Sis Dani Party at Coachella!